Laces- The laces of your walking shoes help to keep your feet in place and aid comfort. Some specialist shop advisors will be able to give you tips on lacing techniques to improve the fit of your walking shoes. Sole- The soles should provide grip that will be effective in both wet and dry conditions. They should be flexible yet stable enough to withstand mixed terrain. Mid-sole- The mid-sole of your walking shoes sits on top of the sole, and should provide cushioning to help absorb shock and improve the comfort of your walk. Shoes have less cushioning than walking boots, enabling your feet to remain close to the ground to help improve stability. A stiffened heel cup will provide additional support and cushioning. Waterproof lining- Walking shoes with a waterproof lining are designed to keep your feet dry in wet conditions. But as well as keeping water out, this lining can also keep perspiration in, so it’s best to decide what conditions you're most likely to be walking in before making your choice. Walking shoes with no waterproof lining can be more breathable, so may be a better option for walking in drier conditions. 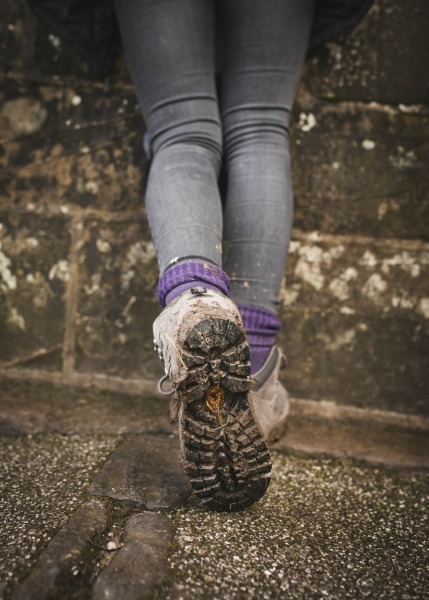 Weight-One of the main advantages of walking shoes over boots is that they're lightweight. This means they won’t weigh you down as much and can be more comfortable. Uppers- The upper material needs to be lightweight yet protective. It must also be breathable, to help make your walk as comfortable as possible. This means that many walking shoes are made of a combination of fabric and mesh or leather and mesh to help improve ventilation. Additional protection is often given to the toe area and a stiffened heel cup helps to keep the foot in place. What should I consider when buying a pair of walking shoes? Visit a retailer with in-store specialists who will be able to guide and advise you. They may also be able to suggest lacing techniques and shoe accessories to help improve the shoes’ fit and comfort. Try on shoes that are one size bigger than your normal shoe size and try them on in the afternoon when your feet have expanded. Try shoes on with a decent pair of walking socks. Make sure the shoes are snug but not tight. Your big toe shouldn’t push into the upper part of the shoe. Choose a store with a testing ramp that will allow you to see how the shoes feel when walking up and down a slope. Some stores also have surfaces of different terrains so you can check out the grip, too. Don’t assume you can just ‘break in’ your new walking shoes. The fit should be right before you leave the shop. Walking shoes or walking boots? If you’re planning a walk and are confused about whether you should buy a pair of walking shoes or boots, you’re not alone. It's a common question among new walkers in particular and, in an ideal world, you would own both boots and shoes so you can choose those best suited to your walk. However, if your budget can only stretch to one pair, the answer will depend on personal preference as much as the walking conditions. Water resistance and breathability- Think about the type of weather conditions and trails you are most likely encounter. This will help determine how important it is that the shoes or boots are water resistant. Many walking shoes are made without a waterproof lining, which makes them more breathable than many waterproof boots, helping to keep your feet cooler. They are better suited for walking in drier, sunnier conditions. Be aware that because of their lower cut, even the best water-resistant shoes will be more prone to letting in water at ankle level when walking through mud, puddles and streams. Most walking boots have a waterproof lining, so are a good option for rainy conditions or for walking in areas where you may pass through brooks or streams. But bear in mind the breathability issue. Ankle support-The lower cut of walking shoes means there's less support around the ankle. Opinion is divided as to whether this makes them more likely to lead to ankle injuries, but some walkers like the reassurance of a well-fitted boot. Walking boots are made with a specific environment in mind. This means that depending on the severity of the terrain and the conditions you will be heading into, the characteristics of the boot, such as the stiffness of the sole or the height of the ankle are specifically designed for the demands you will face. If for example you intend to stick to well-trodden and predictable paths then you can go for a lightweight boot or shoe with a reasonable amount of flexibility and on long journeys this can aid your comfort. If however, you are at the other end of the scale and intend to be moving over uneven, broken or very steep ground then you will need a more rigid boot with good ankle support. If your boots have stiffer soles, you’ll have a more stable platform to stand on, and in essence a higher cut boot behaves like scaffolding, supporting your ankles. Of course, walking encompasses many different landscapes and the majority of people will be somewhere in the middle of this scale, but you get the idea; the further you’re likely to stray from even, flat land, the more sturdy and supportive your boots need to be. But don’t forget, the two most important things to consider are the terrain you will be travelling over and the fit of the overall boot. Thanks to advances in materials, the differences between leather and synthetic boots are increasingly small. In the past it could have been said that leather boots were more durable and easier to care for, whereas synthetic boots were lighter and required less ‘breaking in’. However, today these differences are less pronounced. What this means is that when selecting a pair of walking boots the amount of choice has never been better. Despite this, the most important part of your decision should, and will always be the fit. If they fit correctly then this is the best place to start.